Holy moly! 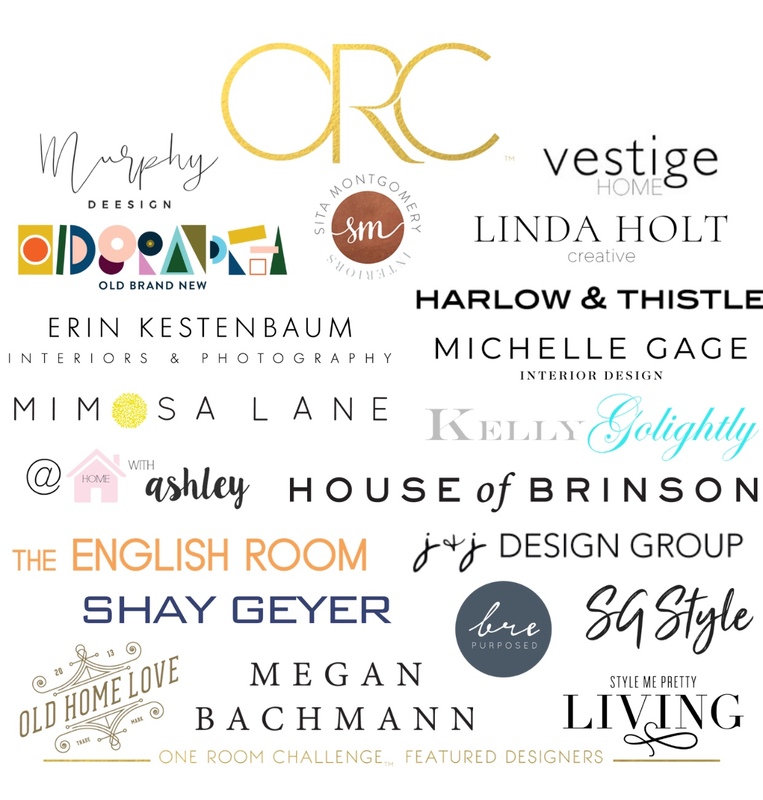 There is certainly a reason this event is dubbed the One Room CHALLENGE. 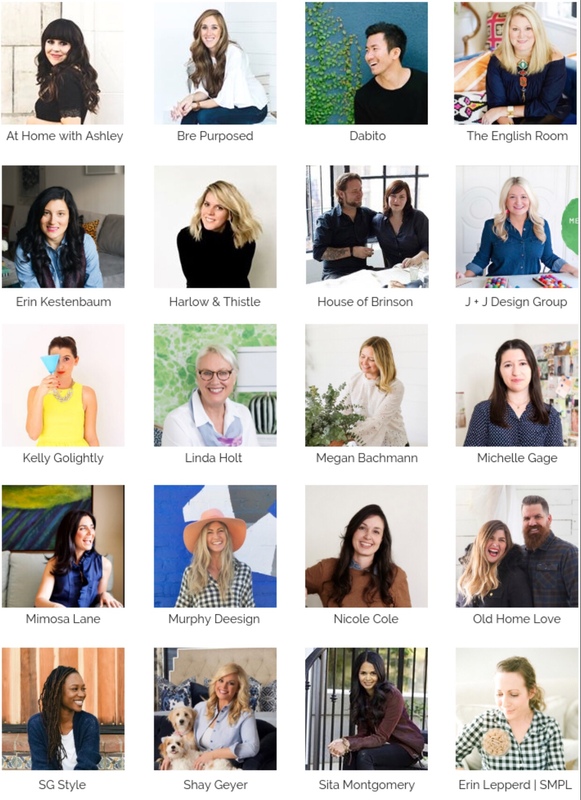 Six weeks is an intense & tight timeline to pull together a project from start to finish when there is tile, plumbing, paint & so many other aspects involved. Trades are on top of each other to get their work done. Unfortunately, this creates more room for error and many grouchy people in the mix. At this point, I go into cheerleader mode – cheering everyone on to make it to the finish line. Let’s start with updates of what happened this week. 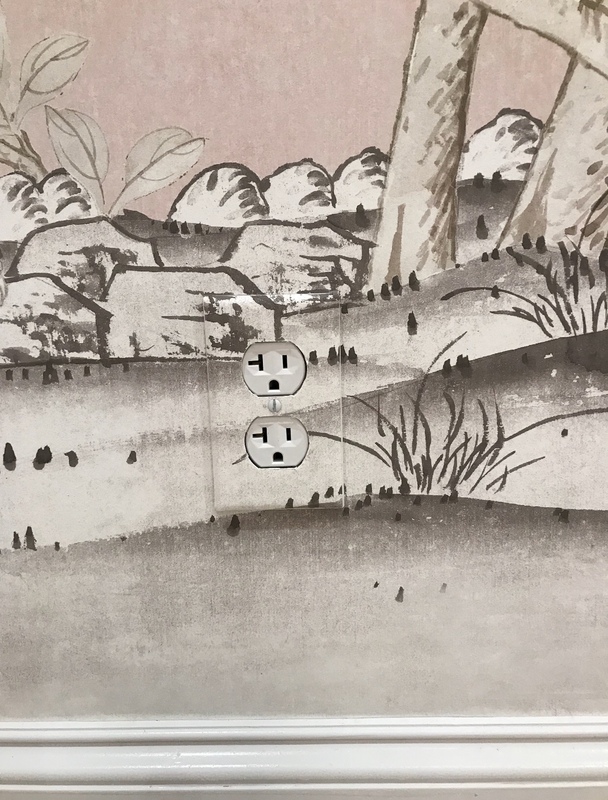 One of the biggest transformations is that the wallpaper went up. OMG! I’m completely in love! I’ll give you a sneak peek but I don’t want to spoil anything for the big reveal. 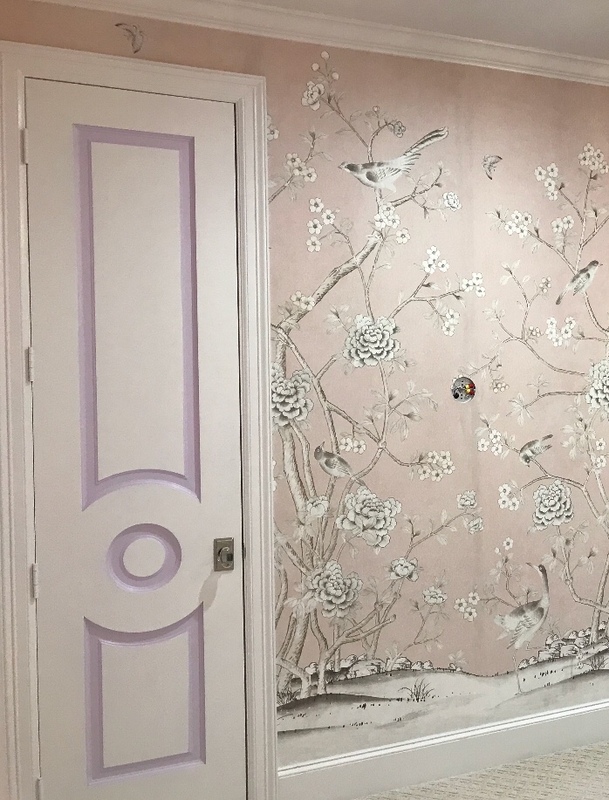 Here it is… the gorgeous wallpaper we used on the day bed wall. The seams are still wet in this photo. I’m completely smitten with this paper & how it turned out!! 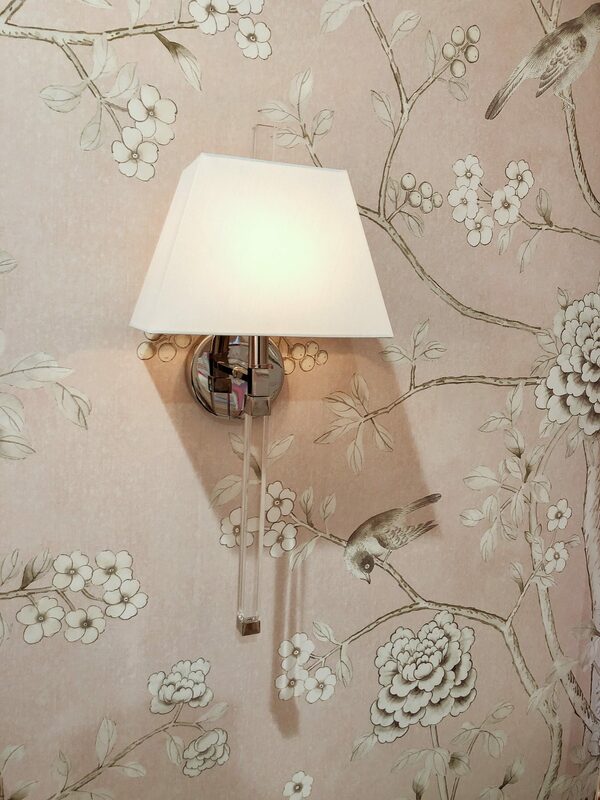 These Crystorama sconces are absolute perfection on top of this wallpaper! I love how the paper in the bathroom turned out too! 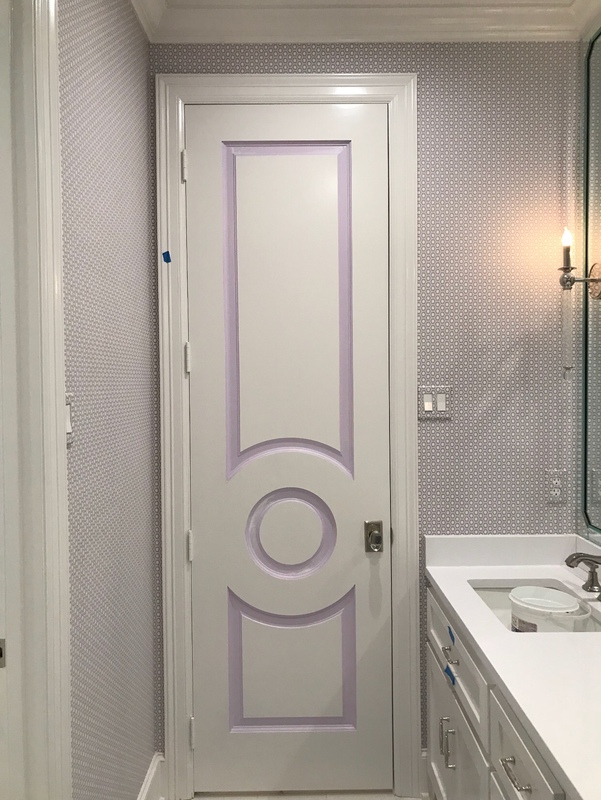 And the lilac paint highlighting the door design is the cutest! All of the design details are starting to come together & we couldn’t be more excited. 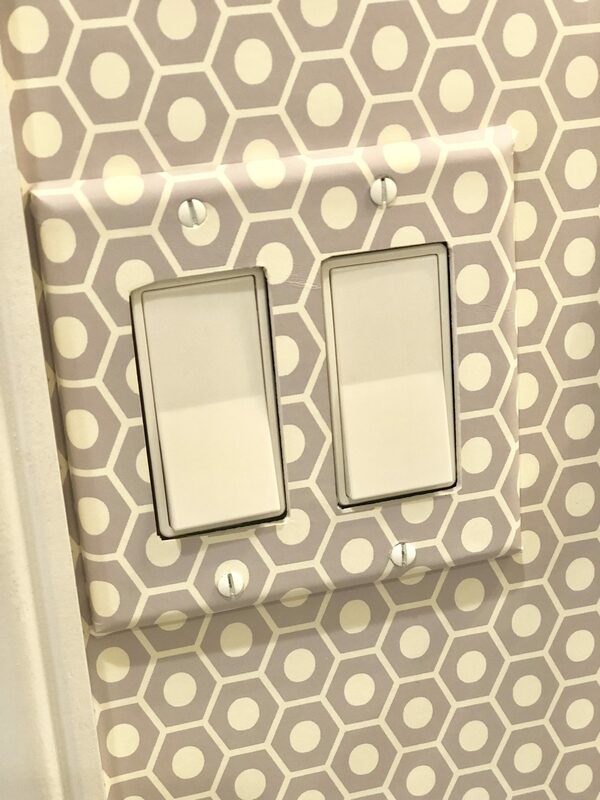 A tricky pattern match on the light switches but my installer did a fabulous job! 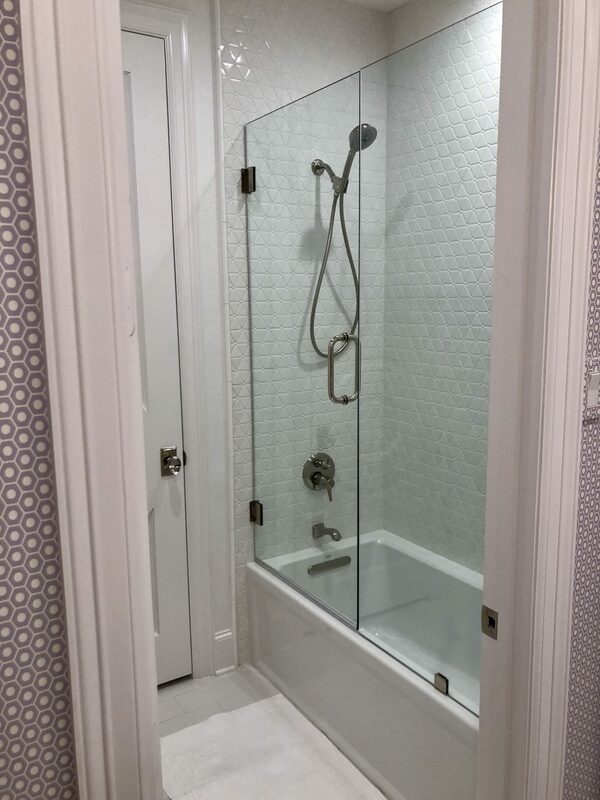 The frameless glass shower door has been installed too. Such a fresh new look in here! The tub, plumbing & tile all gave this bathroom a fabulous new look! We will be installing all of the drapery & furnishings this Friday. 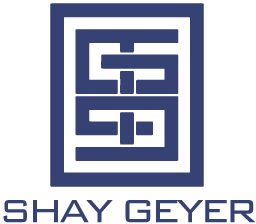 Let’s recap everything that we’ll be using. 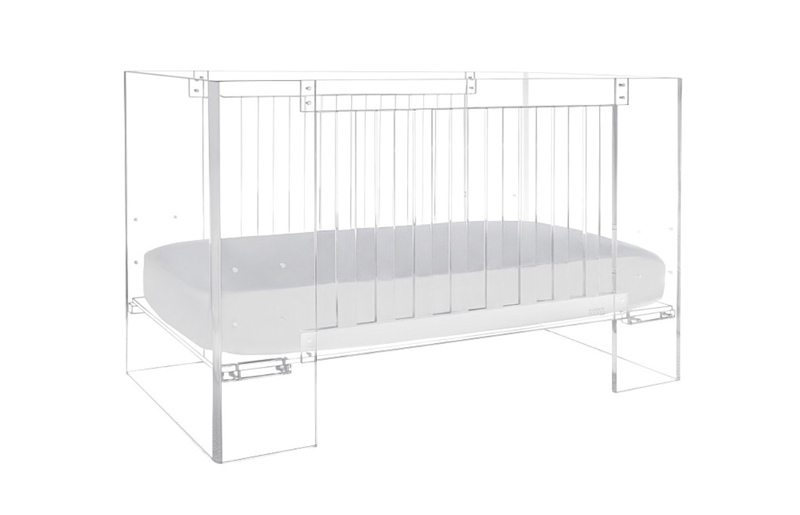 We’ve selected this amazing acrylic crib. I love this crib so much – it almost makes me want another baby! I will just live vicariously through my clients though . The crib is available at IBB Design. 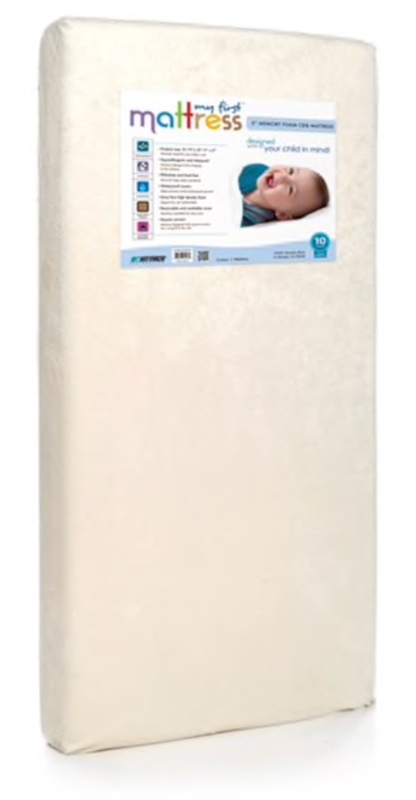 We selected this memory foam mattress from Overstock.com for the crib. The custom day bed I designed is definitely one of my favorite things we have planned for the room! 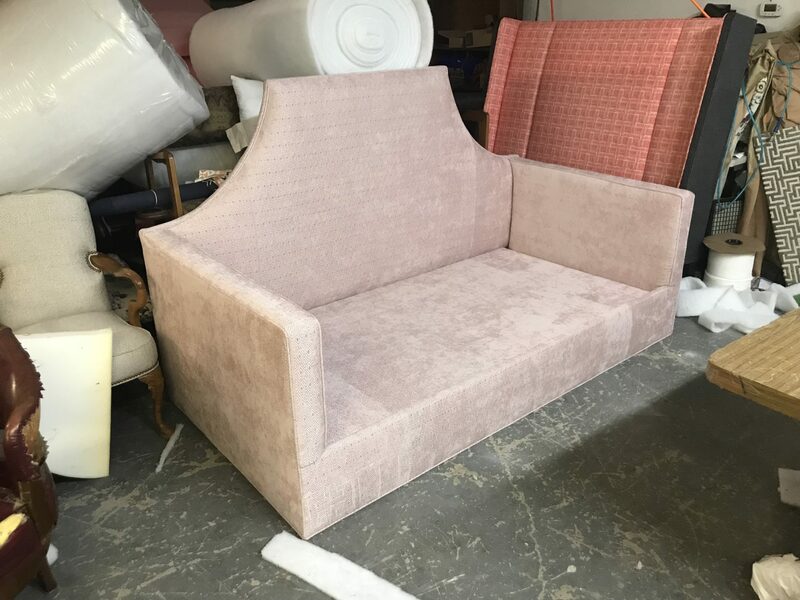 This is a work in progress photo from my upholsterer. Just wait until you see the nail head design that will go across the base & all of the yummy pillow fabrics!! 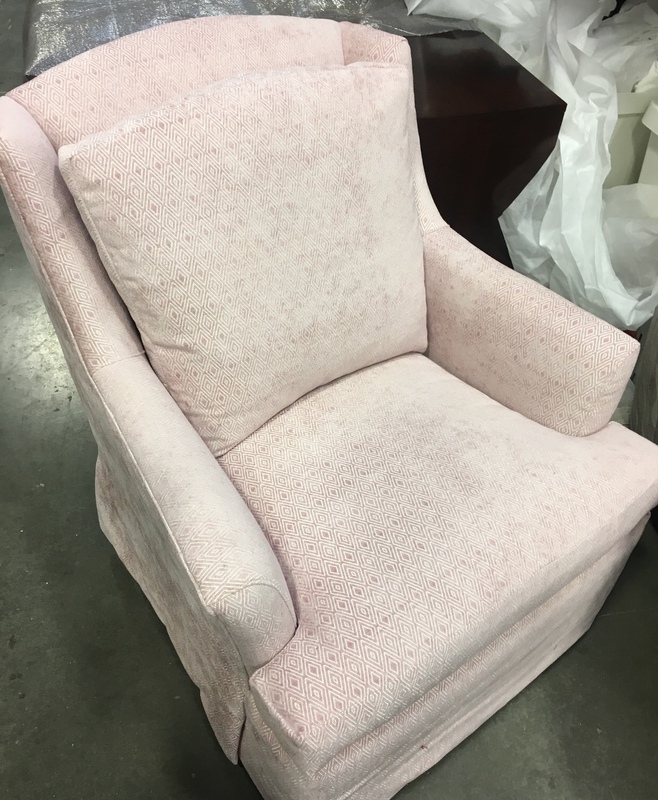 Here’s a sneak peek at the adorable swivel rocker from IBB Design that we upholstered in the same Fabricut blush fabric we used on the day bed. This acrylic bookshelf from Overstock.com will be placed on the wall by the swivel rocker. It will be perfect for books, photo frames, toy bins & to organize other baby necessities. 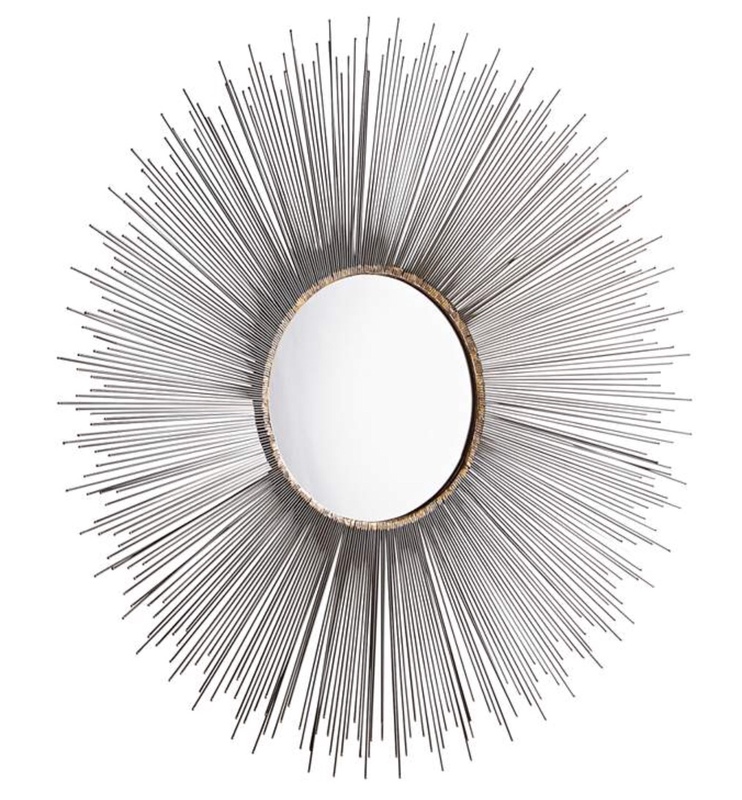 This mirror from Lamps Plus will be going over the changing table. The dresser/changing table & nightstands were all custom from IBB so you’ll have to tune in to my Instagram stories this Friday to get a sneak peek of those . 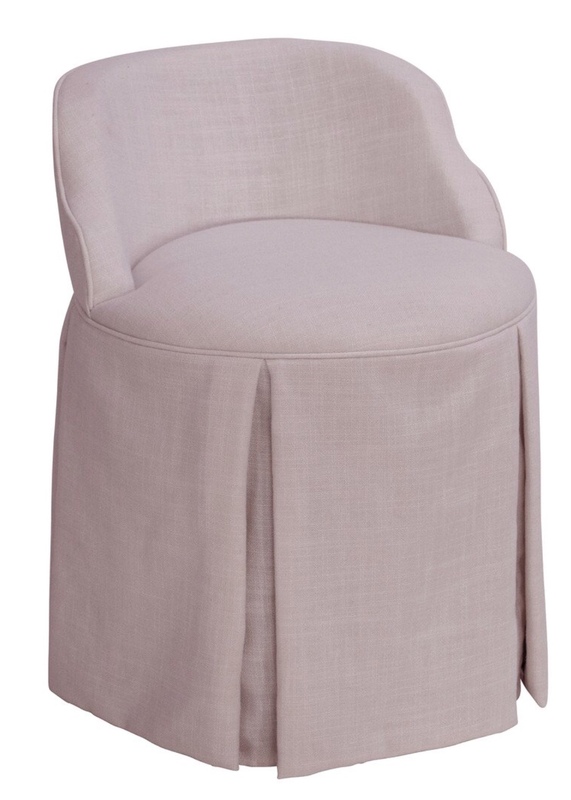 We selected this vanity chair from Overstock.com for the bathroom vanity. We have a special little somethin somethin we’re planing on doing to personalize it. Make sure to check out the updates from the other ORC featured designers & cheer them on! Will all of our design plans be ready in time for the big reveal? Stay tuned to find out! We have one week left y’all!